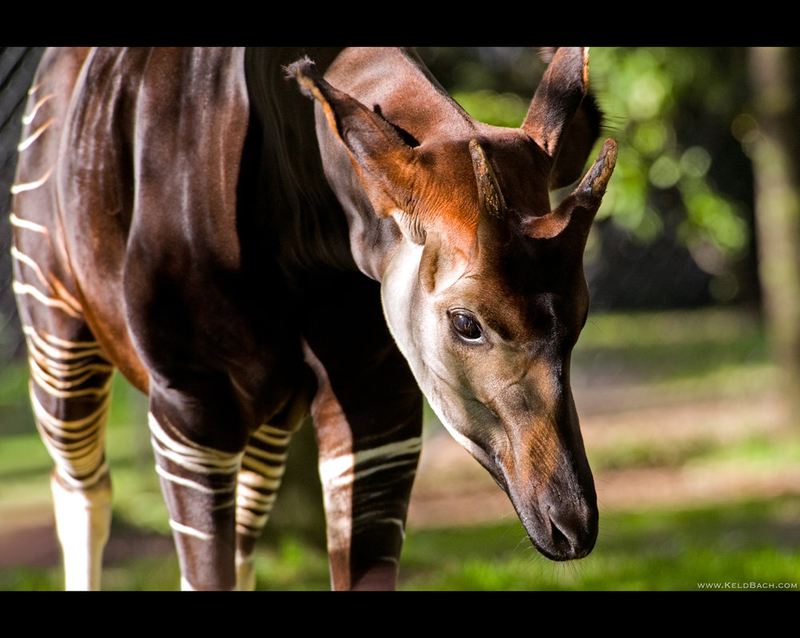 The okapi (O-kap-ee) is a mysterious animal that was only discovered recently. Sadly this beautiful animal is endangered because of hunting and deforestation. What is surprising is that the okapi is the closest living relative of the giraffe, some scientist even think that the okapi looks a little like some the giraffes ancestors. Like the giraffe the okapi has two horns on its head. But unlike the giraffe the male okapis have horns while females don't, the horns are also slightly longer, sharper, and they lean back towards the ears and may be used during mating season and protection from predators. The way the okapi eats is another thing. 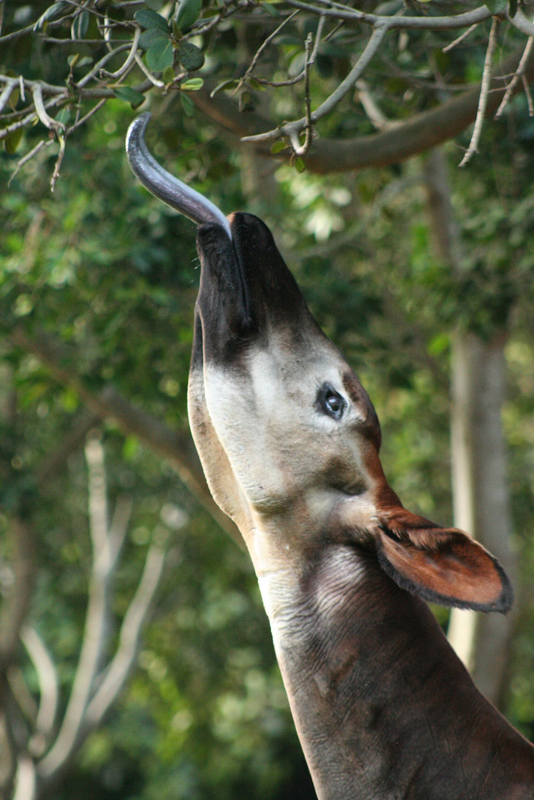 Like the giraffe the okapi has a long, blue/grey tongue and they use it to grab and bring food to their mouth. The reason why the tongue is a blue/grey color is to keep it from getting sunburned. This is the same reason that most animals have dark or black skin. The tongue is also used to clean the eyes and get arid of bugs on the face. As you see in this picture the okapis range is still quite unknown. So little is known about this animal that some people think we know more about the moon then the okapi. Discovered by Charles Darwin during his voyage on the H.M.S. Beagle. The Darwin's fox is one of the smallest foxes in the world. Darwin's fox is distinctive (different) from other foxes because of its coat, It is silver-gray with rusty-red colored ears and legs, blackish tip of the tail, and a white underbelly and jaw. Unlike most foxes Darwin's fox (on the main land) form pairs throughout a year and even share their home range with offspring from previous years, with all family members in contact with each other. But on the island of Chiloé this does not happen. Instead they are solitary only coming together during the mating season and then splitting. 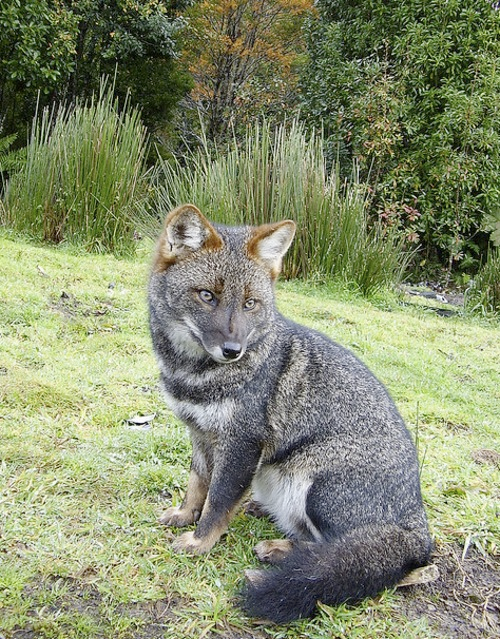 What makes the Darwin's fox critically endangered is that they are unafraid of humans and dogs. Feral dogs pose a threat because they transmit deadly diseases and have been known to attack and kill the foxes. Humans are also responsible by illegally poaching the Darwin's fox for fur. They're two National Parks trying to protect the fox (Chiloé National Park and the Nahuelbuta National Park). But the Nahuelbuta national park on the mainland is small and some of the foxes are known to move out of the park in winter to find more suitable conditions. This makes them more vulnerable to poachers. The Darwin's foxes range is rather small compared to its cozen the Red Fox. The Darwin's fox is only native to Chile. Their are only 250 Darwin's foxes left in the wild. If you wish to contact me or help out with the blog please choose a contact method on the bottom of the page. And please no spam or hate. Please only use these for reporting problems, giving tips and hints, helping with the website (IE suggesting an animal to put on the website, sharing new info, etc), and questions. Please no spam or hate.